President Donald Trump is pictured speaking during a meeting in the Oval Office of the White House in Washington, Nov. 30, 2017. The Trump administration, after calling for all countries to cut ties with North Korea following its latest ballistic missile test, stopped short Thursday of advocating regime change in Pyongyang. "This administration is focused on one big thing when it comes to North Korea, and that's denuclearization of the Korean Peninsula. That's our number one priority," press secretary Sarah Huckabee Sanders said in response to a VOA question at the daily White House briefing. "Anything beyond that is not the priority at this point." Earlier in the day, President Donald Trump, however, appeared to suggest it was time for Kim Jong Un, the third-generation leader of his impoverished country, to be replaced. "The Chinese Envoy, who just returned from North Korea, seems to have had no impact on Little Rocket Man," said Trump on Twitter. "Hard to believe his people, and the military, put up with living in such horrible conditions." Defense Secretary Jim Mattis said Thursday that he was unwilling to conclude diplomacy has not worked with North Korea. 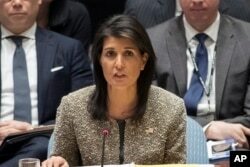 He said the United States would be unrelenting in its activities at the United Nations to pressure North Korea. America's diplomats are operating from a position of strength, according to Mattis, "because we do have military options." FILE - Nikki Haley, U.S. ambassador to the United Nations, speaks during a Security Council meeting on the situation in North Korea, Nov. 29, 2017 at United Nations headquarters in New York. The United States' U.N. ambassador, Nikki Haley, said Wednesday at an emergency meeting of the Security Council that all nations should cut diplomatic and economic ties with North Korea as part of a campaign to put maximum pressure on Pyongyang. "We have well north of 20 countries who have done different things to jump on board with that campaign," State Department spokeswoman Heather Nauert said Thursday. "And I think the news that's coming out of Germany today is altogether positive." Germany earlier in the day announced it was withdrawing a third diplomat from its embassy in Pyongyang, but not cutting diplomatic ties. North Korea has released video showing leader Kim observing the launch of the new intercontinental ballistic missile, which blasted off Wednesday from north of the capital. It reached an altitude of 4,500 kilometers — more than 10 times higher than the orbit of the International Space Station — and traveled about 1,000 kilometers before splashing down into Japan's exclusive economic zone east of the Korean Peninsula. 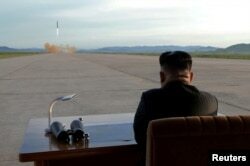 FILE - North Korean leader Kim Jong Un watches the launch of a Hwasong-12 missile in this undated photo released by North Korea's Korean Central News Agency. Kim declared the launch a success, boasting the regime has "finally realized the great historic cause of completing the state nuclear force." Haley warned Wednesday that the launch "brings the world closer to war, not further from it," and said that "if war comes, make no mistake, the North Korean regime will be utterly destroyed." Haley said Trump had told his Chinese counterpart, Xi Jinping, in a phone call that it was time for Beijing to cut off all oil exports to North Korea. In September, the U.N. Security Council imposed tough economic sanctions aimed at cutting off financial and fuel lifelines to North Korea's nuclear and ballistic missile programs. Among the measures was a one-third cut in North Korea's oil imports, as well as drastic reductions in the amount of gas, diesel and heavy fuel oil it could import. 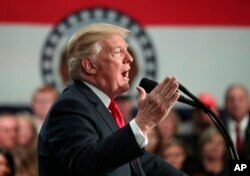 In a tweet Wednesday, Trump pledged to impose new, unilateral sanctions against North Korea, saying they would be announced that day. As of Thursday, they still had not be unveiled. FILE - President Donald Trump speaks about tax reform at the St. Charles Convention Center, Wednesday, Nov. 29, 2017, in St. Charles, Mo. While speaking about tax reform in Missouri, Trump on Wednesday also took another dig at the North Korean leader, again calling him "Little Rocket Man" and describing Kim as a "sick puppy" (someone who is mentally disturbed). "The United States and China will definitely tighten economic sanctions on North Korea. It is unavoidable and North Korea deserves it, particularly given that its development of the Hwasong-15 [missile] raises the threat level toward the international community and the United States," said Zhao Tong, a fellow at the Carnegie Tsinghua Center for Global Policy. Zhao said there was little room left to impose new sanctions. Cutting off oil "is something China will not take up lightly. Perhaps more restrictions can be placed on [North Korean] laborers [working in China], or they can be banned completely," he said. China has already ordered the closure of North Korean businesses in the country and has told Chinese companies they cannot hire new workers from the North or renew contracts. China's foreign ministry said it was still focused on denuclearization and getting all sides back to the negotiating table. "China will completely and thoroughly carry out all resolutions regarding North Korea and its international responsibilities," including sanctions approved by the U.N., foreign ministry spokesman Geng Shuang told reporters Thursday. VOA's Bill Ide in Beijing and Margaret Besheer at the United Nations contributed to this report.